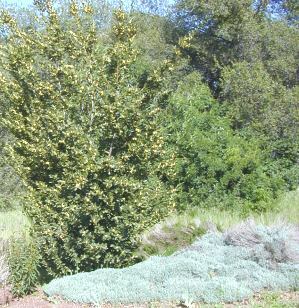 We like our Gray Santolina, sometimes called Lavender Cotton, wild and woolly as you can see in the picture above where it spreads out beneath a 15 foot Greek Bay Tree in bloom. The plant above started out as three small plants about 10 years ago. We sometimes take cuttings from it, occasionally give it water and basically just ignore it. 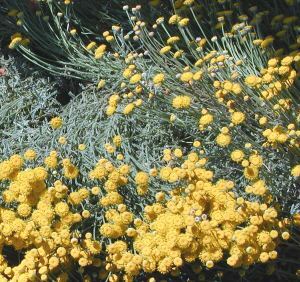 In return, our Gray Santolina gives us a no fuss gray mound of very fragrant foliage and cute little gold buttons that can be dried for arrangements. Because we never prune it, it does have a pretty ugly period (no pun intended) after it flowers. But, it eventually grows back into a beautiful mound. 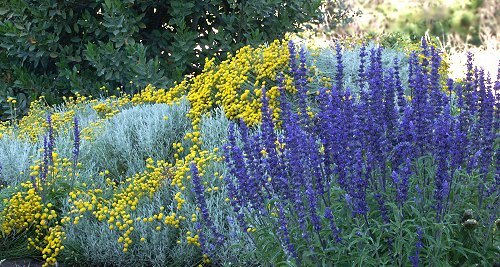 Here the glorious purple of Victoria Sage makes the perfect neighbor for the golden flowers of this Gray Santolina. 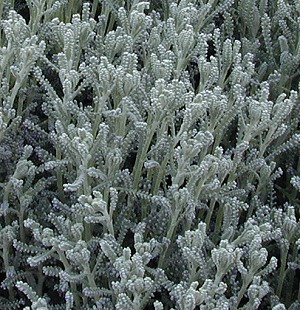 A more traditional use for Gray and Green Santolina is in knot gardens like the one pictured above from Boxford International Gardens in Australia. Knot Gardens are a lot of work and I have always admired those stalwart souls who measure, plant and prune, prune, prune. Knot Gardens are illusionary, employing different colors of plants to form the different sections of rope causing the eye to see the over and under of the knot. Knot Gardens are really best viewed from a second or higher story balcony on a balmy day in spring, but, even covered with a light snow they are definitely magical. Rodale's Illustrated Encyclopedia of Herbs has quite a decent section on knot gardens. It includes several nice diagrams in case you want to make one for yourself. All Knot Gardens are parterres, but not all parterres form a knot. The name parterre (pronounced PAR - tare) is from Old French 'par terre' literally translated 'on the ground'. It is a flower garden having the beds and paths arranged to form a pattern. This precise and informative definition comes to us from the site of Lakewold Gardens. This plant is often available in plug trays. These trays hold 128 of all the same plant. They are a great low cost way to fill a lot of space. Each cell is 3/4 of inch by an inch. Check here to see if Gray Santolina Plug Trays are available.